Negotiations on the U.K.’s split from the European Union could take years. Instead of waiting, enterprise leaders should rethink their strategies now. The election of Donald Trump shocked many observers, but those of us watching from the United Kingdom had a distinct sense of déjà vu. In June, when U.K. residents voted to leave the European Union (the British exit, or “Brexit”), pollsters had mostly anticipated a victory for the “remain” side. Now business leaders have to figure out their way forward in a geopolitical landscape that barely resembles the one from a year ago. The primary lesson for major companies: You need to prepare yourself for several years of uncertainty. If yours is a global company, with operations in countries on both sides of the Atlantic, you may also need to rethink your approaches to managing people, expanding into new territories, maintaining your geographic footprint, and improving your company’s reputation. Whereas the U.S. political transition will take a few months, the British government and the E.U. will spend the next several years negotiating a divorce that balances their economic, political, and social interests. Governments and businesses in other countries will be watching closely, if not intervening. The terms of exit and the trade deals that will follow will be unprecedented in their complexity, and there are no clear rules to follow. Nor is there a reliable timetable. The negotiations were supposed to be concluded in two years, but the High Court’s decision this month mandating that Parliament must be involved calls that into question. Even if that decision is reversed, it could take much longer to resolve related issues (such as the post-Brexit status of Scotland, Northern Ireland, and Wales). To get a sense of the potential delay, consider that Greenland’s exit from the European Economic Community (the E.U.’s predecessor) in 1985 took three years to negotiate. It involved only one industry, one product, and 56,000 people. The Comprehensive Economic and Trade Agreement between the E.U. and Canada was 10 years in the making, in part because the Wallonia region of Belgium blocked the Belgian government’s consent. The terms of the British exit, which will require approval from at least 72 percent of the E.U. member nations, are vastly more complicated. Moreover, the U.K. also needs to negotiate other critical trade deals with nations such as China and the United States. These nations may have incentives to delay, especially after Trump takes office, and the E.U. may intervene if these ancillary negotiations start before the main negotiations are concluded. What should you, as a leader of private enterprise, do in the meantime? You may think your primary response should be either to do nothing or to try to influence the talks and resulting policies. The latter may, in fact, be a viable option; many business leaders are engaging the various parts of the U.K. government involved in shaping the negotiations and the industrial policy that follows. In October, for example, as reported by BBC News, the secretary of state for business publicly stated that the government was aiming for tariff-free trade with the E.U. This reassurance was enough for Nissan to make a statement that it was increasing its investment in the U.K. Other businesses, including Aston-Martin, have noticed and are beginning to lobby for concessions of their own; for example, some have succeeded in influencing the U.K. government to dial back its rhetoric on immigration and monetary policy. Lobbying efforts are similarly beginning to move rapidly in the United States, and we’ll undoubtedly see more of them. But political influence, no matter how focused, can only go so far in a time of immense structural change. The political forces that led to this moment — the mistrust of globalization, elites, trade, open borders, migration, and labor mobility in Europe and the U.S. — are extremely relevant to your business strategy. And the “leave” vote, the Trump election, and the nationalism that is roiling many countries, are all raising the same difficult questions that were probably not on your radar even one year ago. For example: How should you respond to changes in global trade routes and labor flows, which are influenced not just by protectionist policies but by currency movements? Should you channel your investments differently, even before you have a clear idea of what will happen next? If your current activities span global geographies — not just the U.K. and E.U., but major countries like the U.S., Russia, China, Japan, and India — should you expect new barriers to arise among them, and if so, how should you navigate those boundaries? How much will your industry change, and can you afford to stand by while your competitors move forward? Or if they are confused and paralyzed (as many business leaders are), how can you take advantage of their state to strengthen your own competitive position? Finally, if protectionist movements take hold in more countries — as they might in either developed or emerging economies — what, if anything, should you do differently? Many of your competitors are probably still ignoring the aftermath of Brexit, especially the potential changes that may come. Their companies continue business as usual. That gives you an opportunity to step out in front. Instead of waiting for more certainty before choosing a course of action, use the shock as a catalyst for constructive change. Take this opportunity to redesign the one thing you have control over: What your company does and how it operates. Indeed, getting your reaction to Brexit (and other events with a nationalist, isolationist flavor) right could spur innovation and growth in your company. It could also help you build stronger, more transparent, and more responsive relationships with your constituents, including customers, suppliers, workers, shareholders, and directors. Develop a course of action that will be robust under many scenarios. In a period marked by uncertainty, retaining your clarity of purpose is difficult. The fundamental goal is to place your company in a position of strength and readiness, no matter how the geopolitical winds blow and shift. This will help you avoid spinning your wheels and feeling overwhelmed by the unknown. One way to accomplish this is to use a variation of scenario planning. This approach, which involves gathering information and analyzing potential outcomes, will give you more confidence in charting a course. First, think about the possible big-picture effects of Brexit, the Trump election, and other changes in the global landscape. Then take an existing element of your business — for example, a strategic priority, critical program, or value driver — and think through all the possible ways it could be affected by those larger changes. Many business leaders are ignoring the aftermath of Brexit. That gives you an opportunity to step out in front. Consolidate your many alternative futures into just a few; it’s hard to think cogently about more than three or four, and the point is not to be comprehensive, but to jump-start your thinking process. Each scenario should be a plausible story that demonstrates how this situation could evolve; they should all be mutually exclusive and fascinating to think about. Most important, each should have a counterintuitive aspect, something you can learn from. Don’t focus on how likely they are to occur. After all, some of the most significant events of our time (including both Brexit and the Trump election, as well as the 9/11 attacks and the Syrian crisis) were considered unlikely or near-impossible before they happened. You might imagine several scenarios for how the E.U. and its relationship with the U.K. change after the divorce. In one future, the E.U. commits to further reform, in part to preempt exits from other member states. In another, it becomes more unified, but also more controlling and isolated from the rest of the world. In a third, it fragments, and some countries form stronger ties with the U.K. than they had before. Your own most relevant scenarios might involve a different issue, such as food supply, access to university research, but they would still involve thinking about alternatives. As you put these themes together, try to consider the unintended consequences of actions that many others are overlooking, but that are relevant to your business. For example, after the U.K.’s stops contributing financially to the E.U. budget, the E.U. will still have to support 27 countries. How will it manage that change? Brexit may also open the door for new E.U. policies that the U.K. historically opposed, such as a shared military or a single banking market. Ideally, at least one of your scenarios should challenge your view of the way the world works. For example, if you believe that movement toward free trade is inevitable, imagine an alternative future in which the world gradually comes to accept tariffs and barriers. Having articulated these alternative futures, look into the impact each of them could have on your company. How significant would they be? What would be the likely timing of events? Which of your competitors would thrive under this scenario if you did not? What else would have to happen for this scenario to occur? Highlight any risks or opportunities involved, especially those that are more elusive. Finally, instead of devising a separate response for each scenario, bring your colleagues together to consider these questions: What strategy could we adopt that would be robust under any of these scenarios? What investments could we make now to ensure that whatever scenario comes to pass, we will be glad we made that choice? And what can we do now to influence the development of the preferred scenario? Rethink your global footprint. The aftershocks of Brexit provide an opening to launch soul-searching exercises to examine the map of countries where you manufacture and sell your portfolio of goods and services. These exercises can also help you reconsider cost allocation, to adjust expenses to match your new global needs. Focus on strategic objectives: making the most of your capabilities, ensuring access to markets where your capabilities can help you stand out, managing regulators, finding suitable labor pools, and providing opportunities for innovation. For instance, U.S. biotech company Alnylam is going ahead with its pre-Brexit plans to house its European clinical trials and operations center in Maidenhead, U.K., in large part because Britain has a strong life sciences sector and workers skilled in the field. But in a nod to the Brexit vote, Alnylam plans to set up its E.U. headquarters in Zug, Switzerland. Although Switzerland is only an associate member of the E.U., this location is logistically close to European markets and will give Alnylam continued access to pharmaceutical innovation and intellectual property. The right reaction to Brexit could spur innovation and growth in your company. The U.K. TV network ITV announced a cost reduction exercise in response to the economic uncertainty that sprang up after the vote. Some banks announced they were reviewing the location of their HQ. Encourage a diversity of perspectives within your company. Now is the time to build a stronger culture in which people feel welcome to express their own points of view. It’s particularly important to be inclusive in addressing the challenges of a post-Brexit world. Organizations are made up of many types of people, occupying any number of socioeconomic strata and holding a variety of political positions. Employees will hold a wide range of views about the risks of your post-Brexit strategy and the direction your company should take. This diversity of perspective is a strength, not a weakness, of your enterprise. Give a large group of trusted managers and employees the task of developing a course of action in Europe and the U.K. Then encourage them to question one another’s biases and assumptions. In this way, you can guard against what behavioral economist Daniel Kahneman calls the overconfidence bias, in which people become so enamored of their subjective perceptions that they never question their conclusions or hear out anyone else’s divergent opinions. If your decision makers hold views that are mirror images, or if they are afraid that disagreeing with management would harm their position in the organization, their collective biases and blinders may prevent them from seeing an optimal strategy. To make your prospective pool of decision makers as large as possible, draw in people with a range of experiences, professional backgrounds, interests, and areas of knowledge. Include advisors with deep sets of intelligence in areas as diverse as economic development, political engagement, devolution, immigration policy, industry trends, and customer data. Ask open questions to make sure that responses are not exclusively what people believe management wants to hear. As a leader, be transparent and choose your words carefully. In difficult periods, executives must be cautious about what they say and the stances they take. They should express sincere compassion and be on guard against statements that may ruffle feathers throughout the organization. The Brexit and Trump votes have triggered strong emotional reactions, not just in the U.K. and U.S. The environment within many companies doing business in the U.K. has become sensitive. For some individuals living there, the Brexit results raise questions of whether their country is still inclusive. They also have concerns about their stocks and pensions, their jobs, and their ability to get a mortgage in the future. Others are bristling with resentment about generous executive pay and high bonuses. Still others see Brexit as an opportunity to develop a new, perhaps more realistic relationship with the rest of the world. In the end, the vote may lead to tighter controls in some companies, and more “conscious capitalism” efforts, including more participative management and broader-based reward systems, in others. You may have to choose an approach based on what will help you attract and hold the best people in the future. No matter what your perspective is, allow people to communicate their views freely. If people express fear or concern, offer tangible aid whenever possible. Avoid language that can be perceived by employees as callous or threatening; for example, even low-key statements such as “We’re thinking differently about next year’s budget” could be heard in a menacing way. Be similarly self-aware when interacting with customers, suppliers, and shareholders. In a time of turmoil, clearly and effectively communicating the organization’s plans and strategic mission to stakeholders, even if they are still subject to change, can open up new sales channels and precipitate real improvement in product lines and quality. Develop your company’s “foreign policy.” As the global environment shifts, multinational companies will have to become adept at navigating the changing regulations, consumer preferences, and cultural mores in regional and local markets. As John Chipman of the International Institute for Strategic Studies suggests, companies need to develop many of the skills traditionally associated with diplomacy and statecraft. That’s what we mean by a foreign policy, in this context. These skills will be even more important after Brexit is implemented. If the aftermath of the referendum propels you to move into foreign territories that have their own evolving post-Brexit characteristics, you will need to integrate your company with the local society and government. If your enterprise doesn’t yet have these capabilities, you may need to build them. Use the expertise you have gained in your current business locations to collect on-the-ground intelligence (for example, from observers within local governments) that can inform strategies designed to minimize risk. For example, you won’t be surprised by political activism or labor dissatisfaction if your entry into a new country includes enough advance study of the conditions. Instituting a well-resourced corporate foreign policy is an excellent way to buoy your localization strategy. For example, a British company hoping to tap into new opportunities or to avoid potential trade impediments and reputational damage could start explicitly building ties with other countries’ local and national leaders. This could lead to more favorable consideration as the new order evolves. 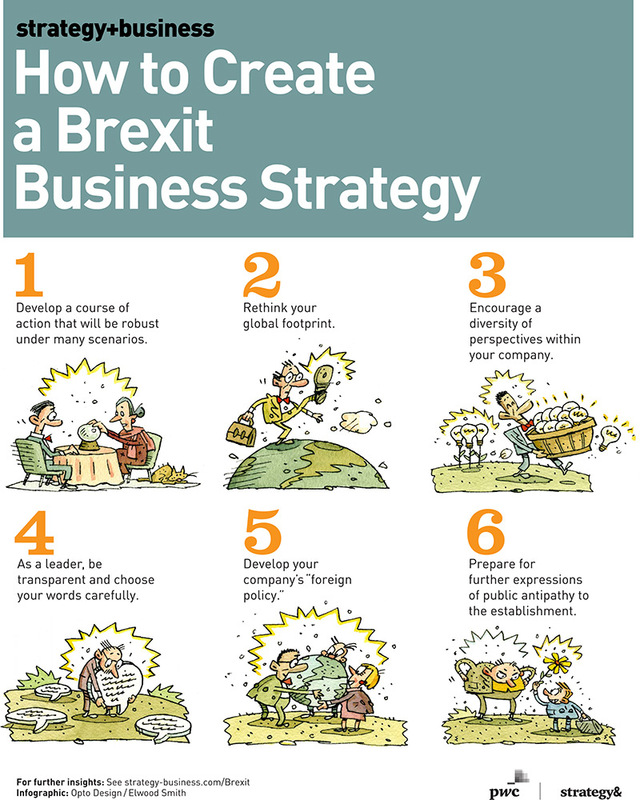 One critical aspect of your company’s foreign policy, of course, is your thoughtful engagement of issues related to Brexit, trade barriers, and globalization. The Japanese government, and some U.S. officials have encouraged businesses to speak out publicly about Brexit, even if it takes them out of their comfort zone. This type of encouragement is unprecedented, and it may lead a number of companies to take positions on Brexit or other geopolitical issues before they have developed true diplomatic skills. The more prowess you have as a company with a foreign policy, the more powerful and nuanced an effect you will have. Prepare for further expressions of public antipathy to the establishment. The Brexit results made it clear that the issues ignited by the 2008 financial crash have not gone away. Business leaders will need to recognize the public’s ongoing resentment of income inequality — and of generous executive pay and high dividends. Your employees will be worried about pension deficits and the potential impact of economic uncertainty on their job and wage prospects. We may also see the rise of conscious capitalism, more attuned to the needs of the people business serves and employs. Pay particular attention to attitudes about immigration. Historically, business leaders have assumed that they can move people around the world without much popular resentment. That may not be true any longer. Borders will be tighter, and moving people across them will be harder, in terms of both managing the regulations and navigating public opinion. If migration of labor is part of your business model, you’ll have to consider these issues now. By taking these steps, you can keep your business healthy while also addressing some of the political and social issues that the electorate has raised. A process like this can catalyze innovation and growth even in the midst of turbulence. You will gain new insight into the strengths of your company: your distinctive identity, your capabilities, and the dedication of your people. You’ll align your company with the devolution of power that appears to be occurring in many countries. One of the surprising long-term results of Brexit may be a higher level of connectivity among citizens, government, business, the environment, and society at large. In all your post-Brexit efforts, try to establish your organization as a model for other enterprises and even governments. You can show, with your company as a microcosm, how to make the transition smooth and beneficial to as many people as possible. For example, in the separation discussions, which are sure to be sensitive and full of pitfalls, government officials will need to focus on options for mutual gain. They will need to be empathetic toward others, pragmatic about their promises to their stakeholders, and mindful of the opportunity costs inherent in delay. Companies can show government leaders how to accomplish this in the way they negotiate their related arrangements. Most multinational companies, British and otherwise, will be watching the Brexit negotiations closely. But clearly this is no time to be passive. T.S. Eliot famously wrote, “However certain our expectation, the moment foreseen may be unexpected when it arrives.” Most executives are sympathetic to Eliot’s sentiment; they wrestle with the reality of it every day. Now, as globalization morphs into its post-Brexit form, business leaders cannot simply wait to see how things unfold. They must move to establish their own identity. They must create the conditions for new, innovative solutions to the problems of cross-border trade, geographic footprints, and collaborative activity — and their actions may encourage governments to do the same. David Lancefield is a partner with PwC UK for Strategy&, PwC’s strategy consulting group. Based in London, he writes and comments regularly on leadership, digital innovation, megatrends, and the implications of Brexit.